60 | TH E M R EP O RT O R I G I NAT I O N S E R V I C I N G A NA LY T I C S S E C O N DA R Y M A R K E T SECONDARY MARKET THE LATEST Fannie Mae's Mortgage Portfolio Shrinks In July, Fannie Mae's mortgage portfolio declined at rate typical of recent months following an unusually slow rate in June. F ollowing an off-month in June, which saw Fan- nie Mae's gross mort- gage portfolio contract at a well-below average rate of 5 percent, the GSE's portfolio shrank at the more customary rate of 24.7 percent in July down to an aggregate unpaid principal balance of about $308.8 billion, according to Fannie Mae's July 2016 Monthly Volume Summary. Fannie Mae's gross mortgage portfolio has contracted at an average rate of 17.3 percent for the first seven months of 2016. The decline from June to July amount - ed to about $7.5 billion, down to its current aggregate UPB total of $308.8 billion. The gross mortgage portfolio fell below its 2016 cap of $339.3 bil - lion in March and has continued to contract. 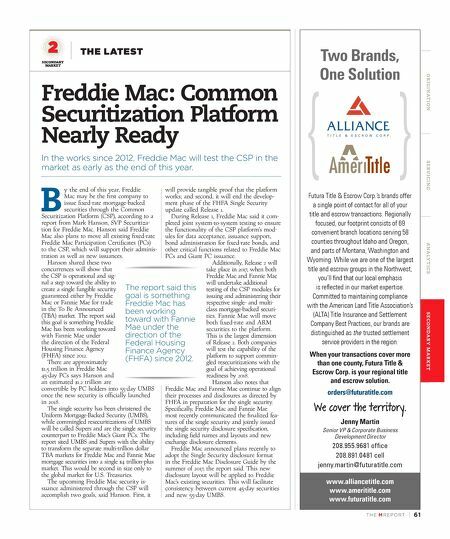 In January 2016, Fannie Mae's gross mortgage portfolio experi - enced a rare expansion, increasing at an annual rate of 5 percent. With July's contraction, the port- folio has now contracted in all but four months out of the last 72 months (since June 2010). The four months in which the portfolio expanded were January 2016, March 2015, January 2015, and December 2012. At the beginning of that stretch in June 2010, the amount of UPB of the loans in the portfolio was $818 billion. Fannie Mae's total book of business, which includes the gross mortgage portfolio plus total Fannie Mae mortgage-backed securities and other guarantees minus Fannie Mae MBS in the portfolio, decreased at a com - pound annualized rate of 0.2 percent in July down to a value of about $3.1032 trillion, accord- ing to Fannie Mae. Year-to-date through the end of July, the total book of business has expanded at the annual rate of 0.2 percent. A total of 6,958 loan modifica - tions were completed on Fannie Mae-backed loans in July. The serious delinquency rate on single- family mortgage loans backed by Fannie Mae fell by two basis points in July down to 1.30 percent. 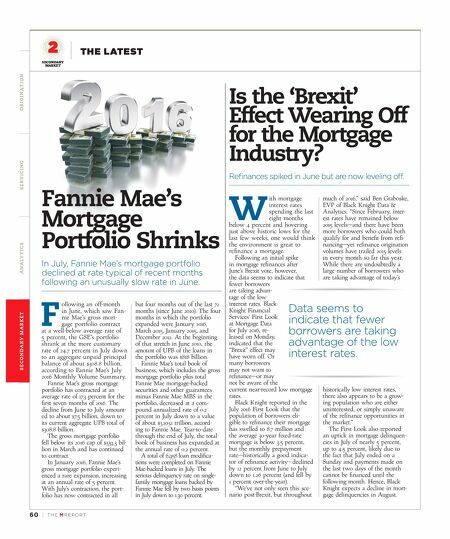 Is the 'Brexit' Effect Wearing Off for the Mortgage Industry? Refinances spiked in June but are now leveling off. W ith mortgage interest rates spending the last eight months below 4 percent and hovering just above historic lows for the last few weeks, one would think the environment is great to refinance a mortgage. Following an initial spike in mortgage refinances after June's Brexit vote, however, the data seems to indicate that fewer borrowers are taking advan - tage of the low interest rates. Black Knight Financial Services' First Look at Mortgage Data for July 2016, re - leased on Monday, indicated that the "Brexit" effect may have worn off. Or many borrowers may not want to refinance—or may not be aware of the current near-record low mortgage rates. Black Knight reported in the July 2016 First Look that the population of borrowers eli - gible to refinance their mortgage has swelled to 8.7 million and the average 30-year fixed-rate mortgage is below 3.5 percent, but the monthly prepayment rate—historically a good indica - tor of refinance activity—declined by 12 percent from June to July down to 1.26 percent (and fell by 1 percent over-the-year). "We've not only seen this sce - nario post-Brexit, but throughout much of 2016," said Ben Graboske, EVP of Black Knight Data & Analytics. "Since February, inter- est rates have remained below 2015 levels—and there have been more borrowers who could both qualify for and benefit from refi - nancing—yet refinance origination volumes have trailed 2015 levels in every month so far this year. While there are undoubtedly a large number of borrowers who are taking advantage of today's historically low interest rates, there also appears to be a grow - ing population who are either uninterested, or simply unaware of the refinance opportunities in the market." The First Look also reported an uptick in mortgage delinquen - cies in July of nearly 5 percent, up to 4.5 percent, likely due to the fact that July ended on a Sunday and payments made on the last two days of the month cannot be financed until the following month. Hence, Black Knight expects a decline in mort - gage delinquencies in August. Data seems to indicate that fewer borrowers are taking advantage of the low interest rates.